Looking to work at Busch Gardens? If so you will need to go the Sea World career page. Busch Gardens is part of Sea World. We will walk you through the application process and get you to where the Busch Garden opportunities are. Step 1 – Go here. Step 2 – Click on Search Openings. 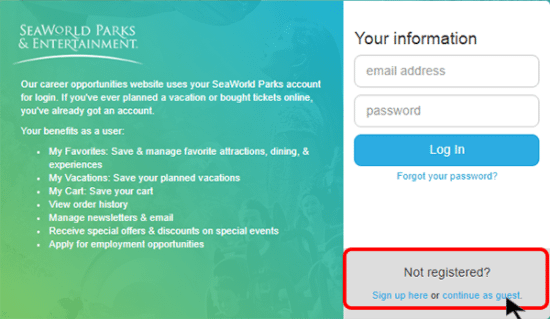 Step 3 – Are you currently employed by Sea World? For this tutorial, we are going to select No, and assume you are not currently employed by Seal World & Entertainment. Step 4 – Type Busch Gardens in the search field (outlined below), and click Search. You will now see a list of available jobs at Busch Garden locations. Scroll through the list and select the job you want to apply for by clicking on it. Step 5 – Now you will see information about the job. This is a description of the position you are looking at. This is more information on the position. If you want to apply for this position click the Apply For This Job button as outlined below. Step 6 – Log in, create an account, or continue as guest. For the purpose of this tutorial, we are going to continue as guest. If you have an account you would log in at this stage. If you plan on applying for multiple jobs at Sea Wold & Entertainment, you may want to consider making an account. Step 7 – Continue on through the application until every section listed in the upper right of the screen is completed. 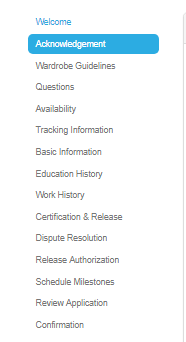 Use the Previous and Next buttons to navigate through this section. Step 8 – Submit your application and you are done.